“Knowledge International University” has organized a 5-day lectures series on “Manners of the Mindful”. 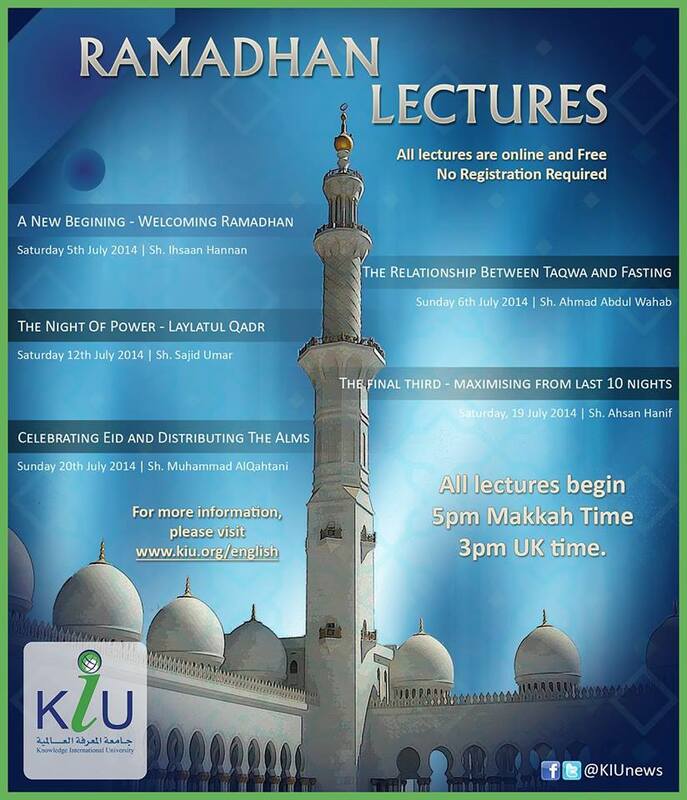 The lectures, starting from Tuesday, 11th September 2012 are free & can be attended live via Elluminate. 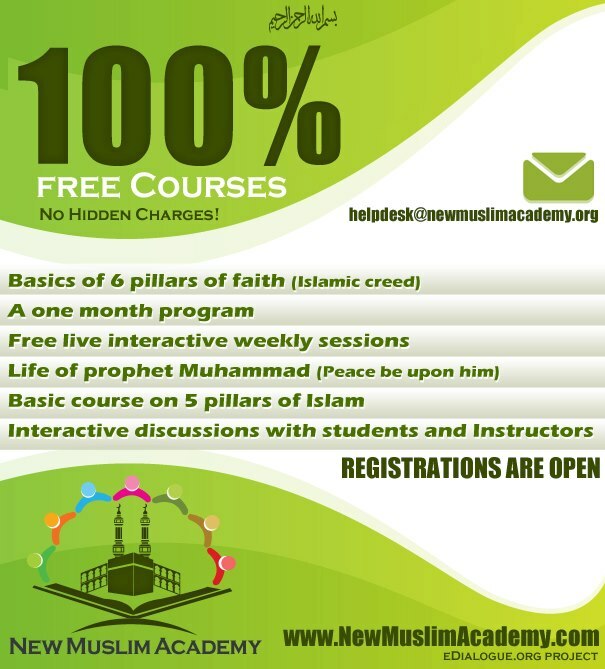 New Muslim Academy [NMA] is offering free Online Courses for New Muslims & those interested in learning & increasing their knowledge about the main & basic teachings of Islaam. The courses are starting from September 2012 & the registration is still open. The course material includes audio and video lectures, Pdf texts as well as tests, assignments. Exams to assess the knowledge gained by student. Click here for more information about the registration & academy. Ustaadh Fahad At-Taahiriyy has launched a new online Project/program “Establishing The Principles”, starting from 1st September 2012 inshaa’Allaah. 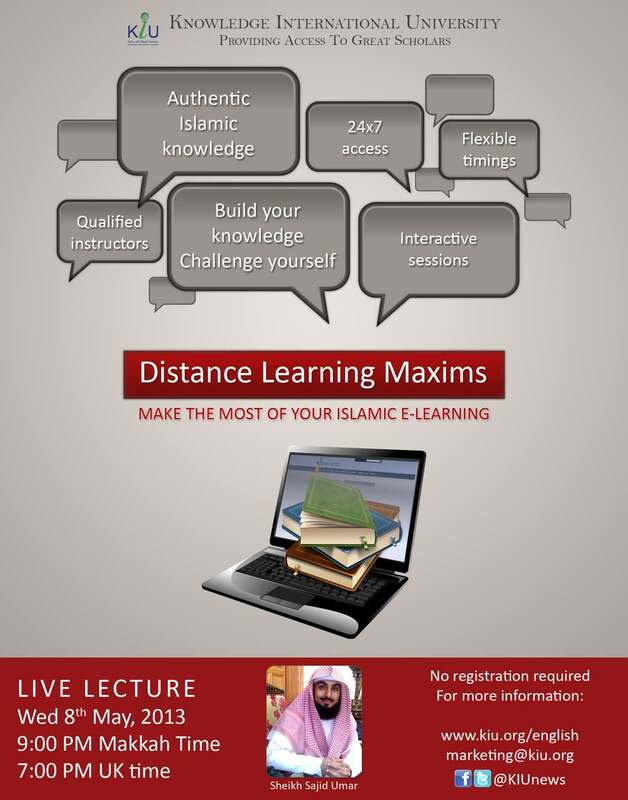 All the classes will be starting from beginning including Sarf/Arabic language and are open to all brothers & sisters. He will be sending you invitations/links to all the classes. 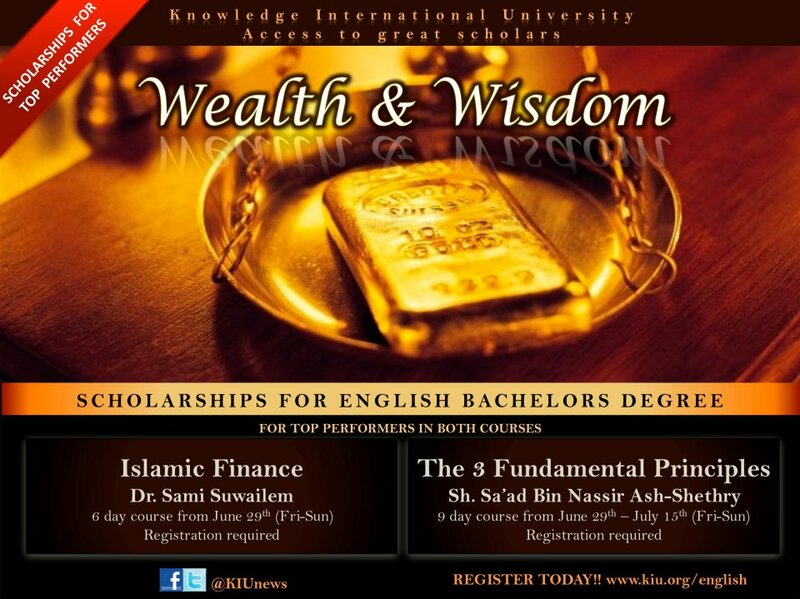 Knowledge International University is offering a great opportunity for new students to apply for a full scholarship to study the entire BA Islaamic Studies degree program without paying the tuition fees. To apply for the full scholarship the student will need to complete the following requirements. 1. Complete the KIU Scholarship application form in full. 2. Complete KIU Summer 2012 Program comprising 2 courses and successfully pass the exams. All applicants must complete the scholarship application form to register their interest for the full KIU scholarship. Once the application form has been completed, the student will receive a username and password granting access to the KIU student portal and the Summer courses. The completion of the 2 summer courses and exams are mandatory for anyone wishing to apply for the scholarship. For more details about scholarship & terms & conditions, click here. Knowledge International University is offering two exciting online courses taught by leading scholars and specialists, free of charge. 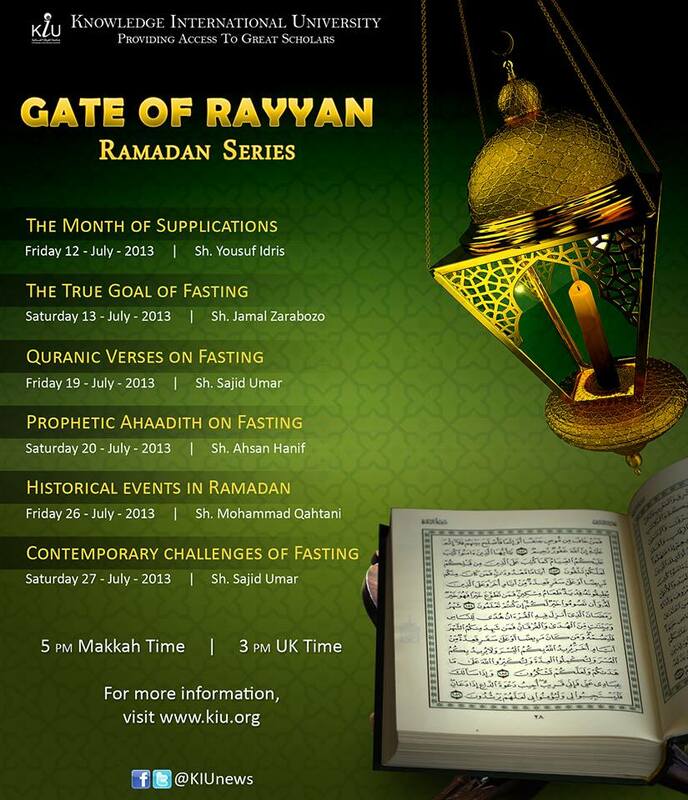 The courses are starting from Friday, 29th June 2012 inshaa’Allaah. Each course will be delivered through a series of live sessions taught using the latest technology platform providing a virtual classroom environment. At the end of the courses, students will have the option to take the online multi-choice exams. Certificates will be awarded after the completion of each course. Dates : 29th June- 1st July, 6th – 8th July, 13th – 15th July 2012. Dates : 29th June- 1st July, 6th – 8th July 2012. Upon successful registration, the student will be given a username and password. These credentials will be used to access the KIU student portal where the course materials and links to the sessions will reside. 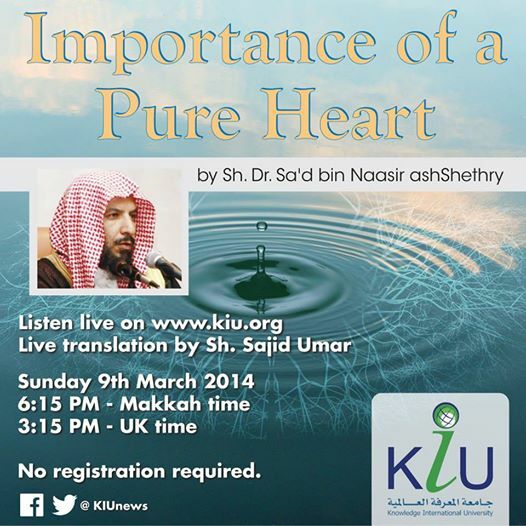 The courses will be provided through a series of online lecture sessions. All sessions will be in audio format and will be broadcast live over the Internet through a virtual classroom. All sessions will be conducted in English (translated where necessary) and will include time for questions and answers. A minimum 70% marks or above are required to be eligible for the scholarship.